Three ways to fix US politics: Reduce big money, end gerrymandering, make it easier to vote. But in addition to the gridlock and rancor in Washington, the American political system has gotten much worse since Obama was elected, through no fault of his own. The Supreme Court allowed unlimited secret campaign contributions and gutted the Voting Rights Act. Twenty-one states passed new voting restrictions targeting the core of Obama’s political coalition. Gerrymandering reached new lows following the 2010 election. 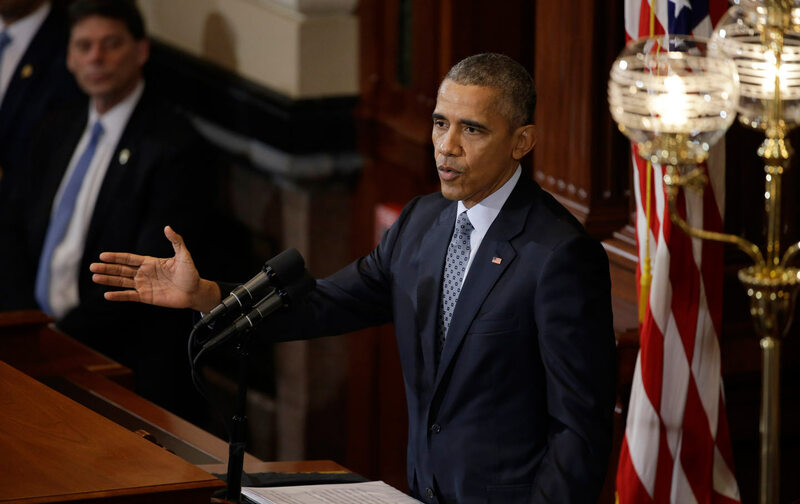 Returning to Springfield to address the Illinois legislature yesterday, Obama offered three ideas for how to repair America’s broken political system. President Obama addresses the Illinois General Assembly. 1. Reduce the corrosive influence of money in politics. 2. Change the way congressional districts are drawn. Congress has a 10 percent approval rating, but 90 percent of incumbent members of Congress are reelected. That’s because so many of them represent safe, gerrymandered seats, which they often helped draw. “In America, politicians should not pick their voters; voters should pick their politicians,” Obama said. That means putting redistricting in the hands of independent actors without a partisan motive. 3. Make it easier, not harder, to vote. To improve voter participation, he called for states to adopt early voting, same-day voter registration, and automatic voter registration. He noted that states with same-day registration had the highest voter turnouts in 2012 and 2014. And he said that automatic voter registration, which has become law in Oregon and California, should be passed nationwide, which would add 27 million Americans to the voting rolls, according to Demos. Obama called for Illinois to take the lead. “Let’s make the Land of Lincoln a leader in voter participation,” he said. Bernie Sanders and Hillary Clinton have endorsed many of the solutions Obama advocated. But with the exception of Sanders’s loud opposition to the Citizens United decision, the issue of political reform has not been central to the presidential campaign. The Democratic candidates should make restoring American democracy a centerpiece of their campaigns, especially as a way to draw a contrast with the GOP candidates, who all support tough new voting restrictions. There have been 13 presidential debates so far and no mention of voting rights, despite the fact that this is the first presidential election since the VRA was gutted. This week Democratic Congressmen Keith Ellison and Mark Pocan sent a letter to PBS urging the network to highlight the issue during tonight’s Democratic debate in Wisconsin. “Our democracy is strongest when everyone is able to participate and it is time to fulfill that promise to the American people,” they wrote.